Hello everyone. Beth Norman here with a card that is one of my favourites. My cousin liked it so much she ordered 16 of them, so you know what I'm busy doing this month. I love the Serenity Prayer and was thrilled to see that Pat had the verse inside a butterfly. The stamp is SD100 Serenity Butterfly. 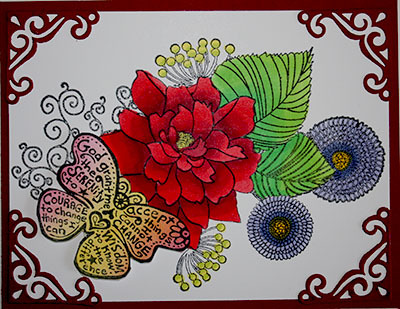 This stamp was paired with S627 Flourished Floral which is a very large stamp that filled my 4" x 5 1/4" cardstock. I sponged ink onto regular white cardstock and stamped my butterfly over top and fussy cut it out. My flowers were coloured with Copic markers. Truly, the camera didn't capture the three different reds I used in my flower. It's so much prettier in real life. Next, I pop dotted the butterfly onto the flower and cut out Cuttlebug corner decorations. Thanks for taking the time to stop by and take a look. Have a good week.